With the Chief RPMAU Elite universal mount, installing a projector on your ceiling just became a whole lot easier. By buying this product you'll earn up to 264 Rewards points. With the Chief RPMAU Elite universal mount, installing a projector on your ceiling just became a whole lot easier. This durable mount has independent pitch, yaw, and roll, and Microzone Adjustments so you can precisely position your projector. The mount can support up to 50 lbs., and self-adjusts to properly support different projector weights. And you can fine-tune the alignment of your projector with fingertip adjustments. The mount's quick connect/disconnect lock makes it easy to change the lamp and filter on your projector — and it doesn't affect your preset adjustments. So once you've changed the bulb, you're ready to start watching movies again. Hollow channels inside the mount keep cables out of sight. With the Elite RPMAU mount, you can have an uncluttered, professional-looking installation. Does this fit the benq HT2050A Projector? 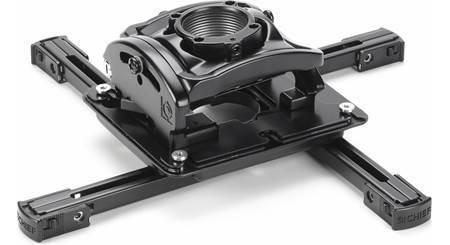 Overview: This Chief RPM Elite (model RPMAU) is a locking universal ceiling mount for inverted front projectors. The mount adjusts in all directions (pitch, roll, and yaw) to give you a perfectly shaped projected picture. It has a quick connect/disconnect feature so you can conveniently remove the projector to change the lamp and filter. The mount maintains its angle, so you won't have to re-aim the projector when it is reattached. Weight Capacity: The maximum weight to be installed on the mount is 50 pounds. It is recommended that the ceiling's structural members can support a redundant weight factor five times the weight of the equipment you intend to install. If the structure cannot support that amount of weight, the structure must be reinforced before you install the ceiling mount. Construction: All components of the RPMAU are made of heavy-gauge steel for a secure and long-lasting mount. Threaded Pipe: The RPM assembly has 1-1/2" diameter NPT threads to accommodate mounting to an extension pipe. Wood Studs: The unit can be attached to wood stud ceiling joists using four 1/4" x 3" lag bolts (not included). Concrete: The mount can be attached to concrete using four Toggler A10 Alligator concrete anchors and four 1/4" x 3" lag bolts (not included). RPM Assembly: Mounts to ceiling (see methods above) and includes adjustments for pitch, roll, and yaw. SLMU Universal Interface: Mounts to the bottom of the projector with the included legs and hardware. The inverted projector, with interface attached, fits and locks into the bottom of the RPM assembly. Note: The total yaw adjustment is 360° for some mounting methods, but the setting can be finely adjusted +/- 20° once the projector is mounted. Centris Technology: The patent-pending Centris Technology gives you effortless fingertip positioning of the projector. The mount self-adjusts to support different projector weights. 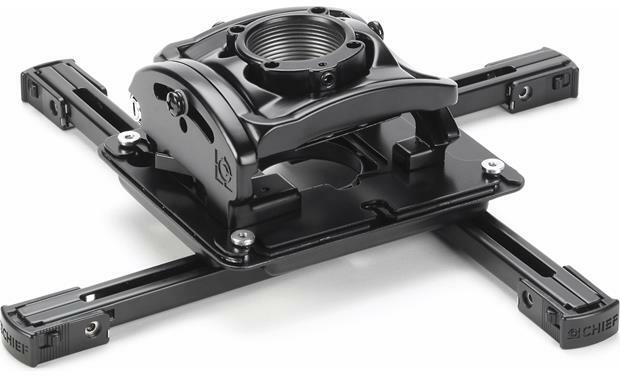 Cable Management: The top of the RPMAU projector mount has a 1-1/2" diameter hole that allows you to easily route cables without additional accessories. Q-Lock Quick Release Lever: You can easily remove and reinstall the projector for quick maintenance. A simple lever holds the projector to the mount, while the Q-Lock provides enhanced security with an integrated key and lock system. When the projector is removed in this manner, the mounting registration is maintained, preventing you from losing your preset adjustments. All-Points Security: The Chief RPMAU projector mount utilizes All-Points Security with its exclusive steel-into-steel locking hardware at all connection points to protect against theft. Using the supplied security hex head screws, requiring the use of the supplied security hex wrenches, secures the projector to the mount. Standard screws are also supplied if you choose not to use the special security hex screws. Supplied Hardware: The RPMAU can accommodate a variety of projector mounting patterns and screw sizes. 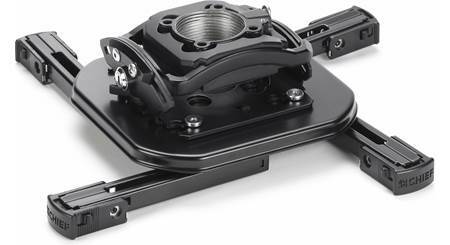 The mounting legs allows the SLMU plate to cover an area approximately 18" in diameter. The RPMAU comes with M3, M4, M5, and M6 mounting hardware in short (12mm) and long (25mm) lengths. RPM Assembly: Width=6.5", Height=2.72", Depth=5.5"
RPMAU Assembled: Width=18.75", Height=4.1875", Depth=18"
I have a Sony SRD projector with this mount installed in my basement. It was professionally done but I can't access the filter due to mount legs covering a small portion. Is there any easy way to take the projector down without having to disassemble the entire mount? I'm somewhat mechanically inclined but have looked at it several times and can't find any easy way to get the projector down without disassembling the entire mount. I have this same issue. I haven't found a way to clean to filter without taking the projector out of the mount. Will this mount fit the Epson 5040ub projector? Yes this mount will work with the Eason 5040. You only need to remove one of the arms on the mount as the Epson will accept 3 but not 4 arms. The 3 arm configuration is sufficient to hold the projector and this worked very well for me. Searches related to the Chief RPMAU Elite Universal projector mount.